Every species requires a beating heart to live, and that heartbeat must maintain a certain rhythm to perform its vital task. Since the 1960s, pacemakers have controlled abnormal heart rhythms in humans. In the 1980s, veterinary cardiologists began using pacemakers in canine patients. 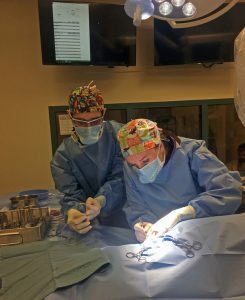 Kelly Wiggen, DVM, cardiology resident at the Veterinary Health Center, and James Karnia, DVM, radiology resident, implant a pacemaker that was donated from a human patient in a 10-year-old dog. The dog was found to have an abnormally slow heart rhythm, which left her vulnerable to sudden death. She also needed surgery for another condition, but couldn’t undergo the procedure until her heart rhythm issues were corrected. Medical equipment companies sometimes make these donations, because the units have exceeded their shelf life for use in human medicine, or because newer models are ready to enter the marketplace. “We also receive — and encourage — donations of pacemakers that have outlived a patient, whether that patient was a dog or a human,” Leach says. Pacemaker donations help keep costs down for veterinary clients, and allow the donor to leave a healing legacy of life for someone’s canine companion. “We get our pacemaker supplies from a multitude of sources,” Leach says. “There are some veterinary-specific companies that make generators and leads for purchase, but those are fairly expensive. We try not to buy brand new ones, because that cost has to be passed on to our patients, and that can be cost prohibitive. As one of the few hospitals with the facilities and expertise to perform pacemaker implantation, MU’s Veterinary Health Center is the primary referral area for Missouri and some surrounding states. “Being one of the few centers around here that provide pacemaker surgeries, we see clients who drive all the way from Oklahoma or Arkansas,” Leach says. “We’re one of the few facilities that offers this type of work, and we’re the only one that offers 24-hour care with potential pacemaker implantation on an emergency basis. “We have access to great equipment, all of the supplies for any of the pacemakers we could want to use and all the equipment to run, operate and program those pacemakers,” Leach continues. “We have the staff that supports it, the building and the materials that offer these kinds of procedures. “With cardiology in general, most of what we do is essentially medical cardiology,” Leach says. “We diagnose cases and come up with treatment plans based mainly on medications. There is a small facet of cardiology, however, that requires certain interventional procedures — basically, minimally invasive surgery. Pacemakers fall into that category and are one of our more common procedures. “The primary reasons we place pacemakers are disturbances in the heart rhythm, where the heart is pacing too slowly on its own,” Leach says. 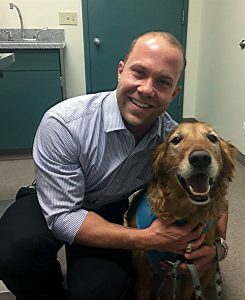 “The vast majority of our patients get diagnosed because they either have symptoms of weakness or collapse, so their owners take them to see their primary care vet, or an unusually slow heart rate is noted as an incidental finding for a routine checkup,” Leach says. “The diagnosis that they need a pacemaker is usually made before they come to see us. Pacemakers consist of a generator, containing the battery and a microcomputer, and the lead, an insulated electrical wire with an electrode at the tip that connects the generator to the heart. Contrary to a widely held belief, the pacemaker does not take over regulation of the heartbeat on a constant basis. The device monitors a patient’s heart rhythm and uses low-energy electrical pulses to stimulate a heartbeat when needed. “There’s a lot of technology behind the pacemakers,” Leach says. “The pacemaker itself is able to make an intra-cardiac electrocardiogram, or EKG, recording; essentially recording what’s happening inside the heart, constantly checking the heart rate and rhythm, and determining whether the pacemaker should take over or not. It sends a small electrical impulse every time it detects that the heart rate is too slow. “Pacemaker implantations are generally a minimally invasive procedure, requiring just a skin incision in the neck to access the jugular vein. Then, we make a very small nick in the jugular vein in order to feed the lead down into the heart,” Leach says. “We’re actually able to watch what we’re doing with fluoroscopy — a real-time, moving X-ray of the heart — so we can make sure that we have it in the right position inside the heart. We keep testing it until we find the ideal spot. Once we’ve secured the lead, the battery itself gets implanted into another incision that’s maybe two inches long at most. This is all beneath the skin of the neck; there’s no chest cavity opening. “It is a procedure, so there are small skin incisions that have to heal. We usually have the patient come back 10 to 14 days after the procedure, either with us or their primary care veterinarian, to ensure that the incisions have healed and to remove the sutures,” Leach says. “We usually recheck them three months after the initial surgery to make sure the pacemaker is still positioned correctly, to check the battery and the function, and to make sure the settings are still appropriate for the patient. After that three-month recheck, we recommend checking them every six months for the rest of their life. We’re always checking to make sure the pacemaker has adequate battery life, adjusting the settings to make sure the unit is optimized for that patient and working appropriately, and to make sure it doesn’t burn through the battery too fast. Veterinary cardiologist Stacey Leach, DVM, with pacemaker patient Duke. “The pacemaker cases in particular are pretty rewarding because they start with an animal that just feels really bad, or is very symptomatic, even collapsing,” Leach says. “We had one patient that was collapsing every five minutes, and we were able to offer a quick fix: put a pacemaker in there, turn it on and within seconds you know whether it’s working or it’s not. Then, it’s not long before these guys can feel really good and go on to live a normal life. “One of my favorite patients is Duke, whose full name is Duke Dizzy Dog Baby Heffington. He’s friends with me on Facebook,” Leach relates with a smile. “Duke still comes back every six months for his rechecks, and he always checks in on Facebook that he’s here when his parents bring him in. “Within the cardiology community, there’s an organization that serves as a repository for donated pacemakers, but there are so many cardiologists worldwide who are doing this procedure that they are very nearly always sold out,” Leach says. “So, unfortunately, we are becoming increasingly dependent on people donating pacemakers directly to us, or purchasing brand new pacemakers, which can run several thousand dollars for the entire setup. “Most of our donations come from family members who were told by a loved one who had a pacemaker that they wanted to donate it to us whenever their time came,” Leach says. “So, their surviving family gets in touch with the doctors and care team to make sure that happens, but it’s important that the medical team knows in advance that donating the pacemaker is something they’d like to do. “Some of the pacemakers we put in our veterinary patients will outlive the dogs,” Leach continues. “Since we already have a relationship with them, our long-term clients will often ask if they can donate the pacemaker to another dog in need.